Directly under Crown Point is an unnamed waterfall, which this time of year is completely frozen. It's water no longer makes it down to Mirror Lake below, which is also pretty much a solid sheet of ice. We've had some pretty wacky weather lately. 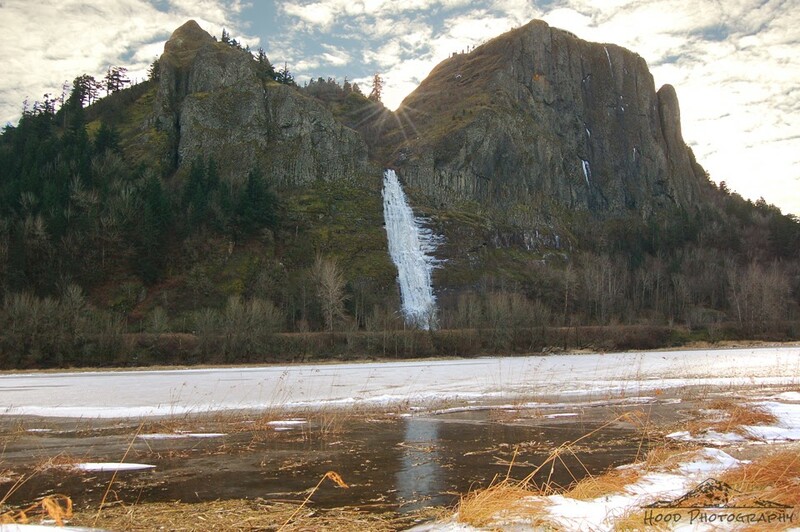 But I love that all the Gorge waterfalls are frozen. So pretty! Oh, how cold it must be to do that! Wow! That's amazing. Can't say that I have ever seen a frozen waterfall before. It must be super cold there! Fantastic photo for SWF!Thank you for sharing and have a nice weekend! Oh, an fantastic capture for the day indeed!! Really awesome!! We have had some COLD weather recently here in the northwest, haven't we!! Have a great weekend! Stay warm! The wispy threads of iced water spreading on the cliff face are just amazing. Gorgeous scene. A most impressive sight. Glad you got a photo to show us, an excellent photo! that's amazing… a frozen water fall!